In reading about a new version of and model for web browsing in Windows 10, I often find myself nodding along and thinking “‘Bout time!” Over the past two years, I’ve been making a steady move away from IE to Chrome and Firefox, not necessarily because I want to, but because so many of the websites I visit either don’t work very well (or at all) in IE, and seem to work fine (or at least much better) in one or the other two of those browsers. 1. Facebook: I’m nowhere near as active on Facebook as others I know, but I do drop in a couple of times a day to see what my friends are up to, and to post updates about blog posts, articles, and so forth. In IE, Facebook crashes or hangs pretty often (more than once a day) so I’ll often fire it up in IE, get stuck or hung up, and simply switch to Chrome instead. 2. LinkedIn: I use LinkedIn for a lot of different professional activities, and also post updates there, too, as on Facebook but also with curated pointers to quotes and articles. Lately, much of the active content on LinkedIn either doesn’t work, or takes forever to run, whereas it works quickly and easily on Chrome and/or Firefox. Same goes for Google+. 3. Hang one tab, hang the root executable: I used to think that browser tabs were pretty isolated from each other so that you could keep going with some even when one or more others encountered issues or slowdowns. Lately, I’ve found myself having to use Task Manager to identify which IE (tab) session is hanging or stuck, and hoping that a right-click to “End Task” will actually do the trick and bail out of the offending or failing browser tab. Sometimes it works, but more often it doesn’t and I have to kill everything to get IE working properly again. 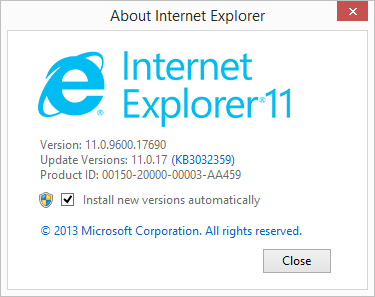 It may not be you or IE. I use IE exclusively and generally I like it. Primarily because it is the Microsoft Windows browser. Yes, there are occasional problems but I am not sure that IE is fully to blame. I have seen web developer make sly comments that they deliberately exploit IE foibles to promote their favorite browser without that particular foible as the required browser for their website. Changing browsers is promoted by Google in particular and whoever wants to promote their precious favorite browser for their purposes, not necessarily for my benefit. I have also observed that web developers are getting far too "creative" (I am going to try to be nice...) making "excessively" (I was thinking of a far harsher word...) complex web designs to demonstrate just how "clever" and "creative" they are. I am reminded of high school "programmers" that have not learned the importance of making reliable, functional, and compatible programs rather than guerilla demonstrations of machismo and yes machisma prowess. I am stretching the definition of machismo/machisma to mean any attempt to prove you are smarter, better, more clever, ... than somebody else. I believe web specifications have developed enormous bloat to support all the tricky, entertaining, impressive, ... features they can possibly cram. I confess that software developers, languages, operating systems, and programming environments have not been immune to feature overload and bloat. Whatever happened to the principle of "Keep it simple"? Dijkstra would be turning over in his grave. Thanks for your replies. I have some resonance with both points of view. I do find myself switching to Firefox sometimes, for access to the Pearson CMS (which doesn't play well with IE). I've also noticed blogging for TechTarget and other WordPress sites that IE has occasional issues with the active content (especially controls) for that environment, too. Sigh.